Regardless of your age, or the amount of time you have to dedicate, you can offer Christ your praise, through sharing your talent. Friendship Baptist provides opportunities to share God given talents, blessing the Body of Christ. The Worship Team is directed by Albert Latham, and is recommended for ages 14 and up. 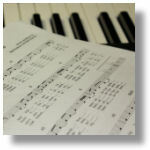 “Worship Teams” are dedicated to opening your heart through song each Sunday morning. Our mission: What a great way to serve the Lord by participating in this program. If you are like so many who do not have the time “every” week to dedicate to the more formal programs, this program was designed just for you. We are providing you a come-when-can, avenue to serve the Lord through song, and fellowship. 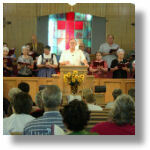 Our adult choir is directed by Albert Latham, and is recommended for ages 14 and up. The adult choir blends with the congregation, as we provide the beautiful voice of praise during our worship services. There are also special choir performances during the annual holidays. Adult Praise Group Ages 30 and up. Providing songs of praise every first Sunday of the month. Practice is held the previous Monday at 7:30. To keep practice time short we provide the soundtrack and sheet music so you can practice at your own pace. Young Adult Praise Group Ages 14 and up. Providing songs of praise every third Sunday of the month. Practice is held the previous Wednesday after the evening service. If you would like to be a part of these worship services, we would love to have you! Please contact Darlene Satterwhite, or Margaret Hart at the Church Office at 972-285-4544 to have your name added to our list and be placed in the rotation. FYI: Check your weekly bulletin for next week’s scheduled talent. Watch your mail, every month Darlene and Margaret mail a calendar for the upcoming month to those scheduled per week, per service, providing you ample time to prepare to share your blessing with us.